Crepes are a blank canvas that can be taken in a lot of directions. After I made up a batch of crepes, I made half of them sweet and half savory – a little dinner and desert action. The banana chocolate crepes were the perfect desert, and since all the crepes had been made ahead of time, all I had to do was make the filling. Cut bananas to 1/4″ slices. Melt butter over a medium heat in a 10″ non-stick skillet. Once the butter has melted and stopped foaming, add the banana slices and brown sugar. Shake the skillet to ensure the bananas are well coated. Cook the bananas until they begin to brown and caramelize, roughly 3 minutes. Flip the bananas with tongs or a spatula, and cook until the other side begins to brown. If you want to add the rum, do it after you flip the bananas. It is probably best to remove the pan from the heat when doing this to ensure nothing catches on fire. 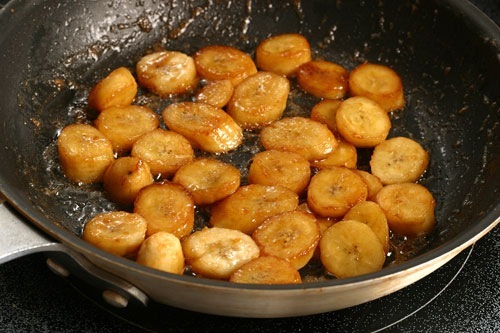 After the bananas have browned on both sides, remove the pan from the heat. Get out your crepes. 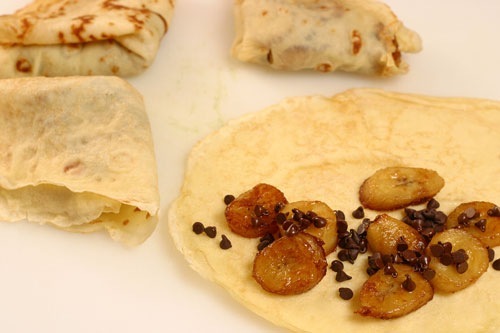 Place a quarter of the bananas and chocolate chips on one half of the first crepe. Fold the crepe in half, and then in half again. The crepe should look like a quarter wedge of a circle, or a pizza slice. Repeat this process for the remaining three crepes. Place the crepe wedges into the pan that was used to cook the bananas. Arrange them to form a circle. Heat the crepes over a medium heat to help ensure that the chocolate melts, shaking the pan occasionally. Cook for about two minutes and then serve! Looks great! 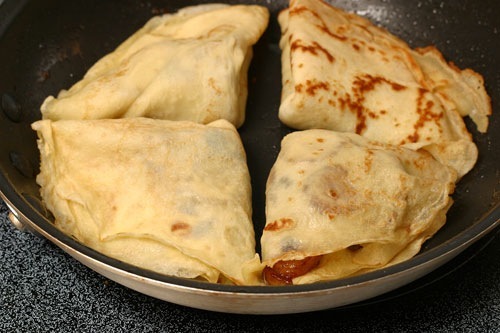 I’ve always wanted to make crepes and these look perfect! I’m a Nutella junkie so I’d probably top mine with that and more fresh banana slices. Yum! Mmmmmmmmm, rum is definately not optional in this house! Thanks for sharing! How many ways can I say YUM?!?!? to get the correct spelling for Dessert,as opposed to the Sahara or Gobi desert. Nutella makes everything better! Walnuts sound like a great suggestion too… Thanks! Try replacing the chocolate chips with some Nutella, and toss in a handful of walnuts as well. It’s most excellent. Hey, Guys, I really like this site. Makes me hungry. Sweet or savory – what’s not to love – they’re delicate and don’t fight with the filling. Those look good! Bananas caramelized in butter and sugar sound so good. 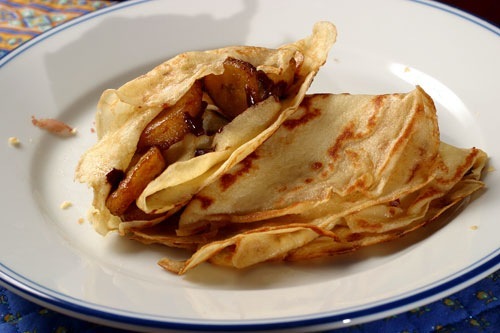 I just made a batch of Crepes last weekend… I LOVE THEM!! I filled my with fresh strawberries and others with homemade jams that my mother made. I love them just by themselves so much that sometimes I hate to fill them!! Yours look fantastic. I am going to have to try to make those!